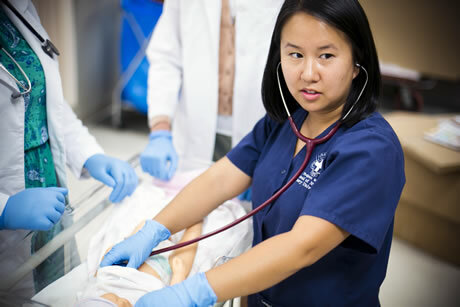 The Nell Hodgson Woodruff School of Nursing has nearly 500 students pursuing a nursing degree for the first time or continuing their nursing education with a master’s or doctoral degree. The faculty, staff, and students of the Nell Hodgson Woodruff School of Nursing are dedicated to the values of scholarship, leadership, and social responsibility in shaping the current and future work as members of a leading private nursing school. Emory's School of Nursing, Marcus Autism Center, and the Georgia Department of Education have teamed together with funding from the United Way of Greater Atlanta to explore the importance of active communication with children during infancy. Dr. Darcy Mahoney, School of Nursing assistant professor, discusses the Talk With Me Baby study, and how delivering "language nutrition" by talking to your child from an early age can improve vocabulary and reading performance. Dr. Melissa Pinto, School of Nursing assistant professor, discusses her pioneering research that uses technology to advance traditional health care delivery paradigms. Pinto¿s program, Electronic Self-Management Resource Training for Mental Health (eSMART-MH), is avatar-based and immerses young adults into a virtual, primary care environment. The eSMART-MH depression self-management program has shown to significantly reduce depressive symptoms in young adults.